Considering Incarnation is based on nine moments in the Gospel accounts surrounding the birth of Jesus. The narrative is reduced to simple relationships of hands and wings, telling the story as a series of conversations of humans with one another and with angels. In the first moment Zechariah spreads his hands helplessly as the angel tells him that he will remain mute until the birth of his son. Next Mary and the angel hold their hands in gestures of mutual submission, each recognizing the importance of the task to which they are called. Then Mary visits her relative, Elizabeth, and each greets the other with a gesture of prayer. Meanwhile Joseph hears that his betrothed is carrying the divine Child, accepting the angel’s message with hands clasped tightly together. Next the gestures of Zechariah and Elizabeth are repeated as they celebrate the birth of their son, John. In the sixth panel Mary opens her hands to receive the gift of Jesus, who appears in the likeness of a lamb, while Joseph stands prayerfully by. In the seventh panel the air is filled with beating wings as the hands of the shepherds open in joyful astonishment. This is followed by the arrival of three praying Magi, following the star. Finally Joseph meets the angel again, taking Mary and Jesus to find safety in Egypt and bringing them back again when the danger is passed. 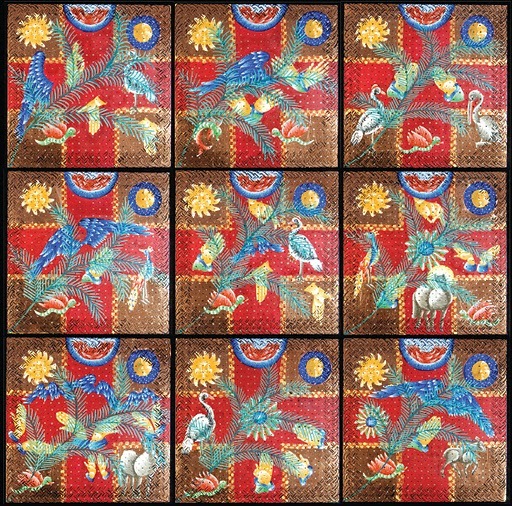 These nine small paintings (each is only 12” x 12” or 30.5 centimeters x 30.5 centimeters) were conceived as a single work of art, although each of them can also stand alone. I have shown them in various arrangements, but I like them best as you see them here, grouped closely together in a larger square composed of smaller squares. I worked on them all at once, moving from one to another in my studio as I waited for paint to dry on one or saw something in another that required a change. It was as if the story was all happening at once, rather than unfolding over time – in the way the Orthodox think about icons, which show the eternal nature of Jesus and the saints rather than their changing, temporal details. These works, however, are not icons, but rather my own response to the story of the Incarnation in visual terms. Sometimes people ask me about the birds, fish, and other creatures in these paintings that do not relate directly to the scriptural record surrounding the birth of Jesus. These creatures and others, like deer or seraphim, appear in virtually all of my paintings. While I am generally reluctant to ascribe any kind of allegorical meaning to them, most of them are derived from medieval manuscript illuminations. In some traditions the peacock is understood as a symbol of resurrection, the pelican is a symbol of Christ and the white crane is a symbol of long life. The little winged serpent, which also shows up frequently in my art, references both European and Asian traditions about dragons. It is also my own answer to the question of how the serpent got around before it was sentenced to crawl around on its belly, as we are told in Genesis. In all my paintings I attempt to evoke the same sense of eternity, of the divine presence, that I find in the rich mosaics, paintings, jewels and precious metals that adorn many places of worship. This I also perceive in the gleam of flickering candles or in a night sky filled with stars. As a way of making concrete my belief that every time and place participates in God’s self-revelation, I combine elements from the icon tradition of the Eastern branches of Christianity, the elaborate knot work found in Celtic artifacts, the space-filling patterns of Islamic tiles, folk motifs from Latin America, Africa and Asia and contemporary notions about art. The resulting paintings are intended as an offering into the life of the Body of Christ, my own prayers made visible as an invitation to others. Deborah Sokolove: Considering Incarnation, 2010, acrylic and copper on panel, 91,5 x 91,5 cm (the small panels 30,5 x 30,5 cmeach). Deborah Sokolove is the Director of the Henry Luce III Center for the Arts and Religion at Wesley Theological Seminary (WTS), where she also teaches courses in art and worship. She received her BA and MFA from California State University at Los Angeles; a Master of Theological Studies degree from WTS; and the Ph.D. in Liturgical Studies from Drew University. Before coming to Wesley as Artist-in-Residence in 1994, she taught art, design and computer imaging at the university level. In recent years she has been a regular contributor to ARTS, the journal of the Society for Arts in Religious and Theological Studies, and her essays have appeared in several books on religion and the arts. Her work has been shown locally and nationally and is represented in numerous collections. Her recent book, Sanctifying Art (Wipf and Stock Publishers, 2013, seehttps://wipfandstock.com/store/Sanctifying_Art_Inviting_Conversation_Between_Artists_Theologians_and_the_Church/), invites artists, theologians, and the church at large into a conversation about art, beauty and the need of the world. See more of her work atwww.dsokolove.com.